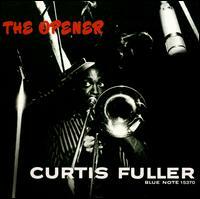 The Opener is an album by American trombonist Curtis Fuller recorded in 1957 and released on the Blue Note label as BLP 1567. The Allmusic review by Stephen Thomas Erlewine awarded the album 4½ stars and stated "The Opener is trombonist Curtis Fuller's first album for Blue Note and it is a thoroughly impressive affair". Years given are for the recording(s), not first release. This 1950s jazz album-related article is a stub. You can help Wikipedia by expanding it.